Jet black finish complements any décor! Shipped knocked down to save on assembly and freight costs! 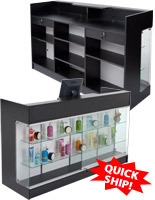 Tempered glass construction is a safe alternative to traditional glass showcase displays! 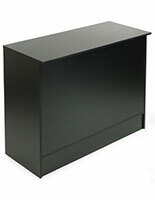 This black showcase will be a great addition to your retail furniture collection. 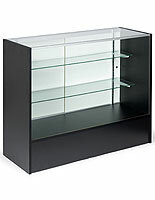 Whether you are just opening up a store, or just need a few new pieces, this economically-priced showcase is the perfect display case for you! The 5' long showcase can showcase jewelry in a jewelry store, upscale items in a boutique, candy in a movie theater, artifacts in a museum, perfume in a department store, and much, much more. The possibilities are endless with this full-vision glass display showcase. 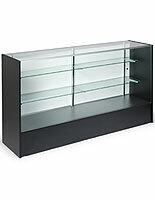 This showcase, also known as a display cabinet, has anodized aluminum extrusions, fully adjustable tempered glass shelves, sliding hardboard rear doors, and plastic feet. 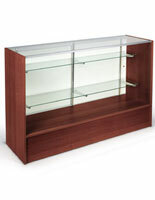 The glass display, showcase is crafted from a combination of tempered glass and melamine panels. A tempered glass showcase is a safer alternative to a traditional annealed glass showcase as it is much less likely to break, and if it does, it will shatter into small, manageable pieces, rather than large shards. Melamine panels are a smart alternative to wood panels on a showcase as they are much cheaper, but are still durable and look like real wood. 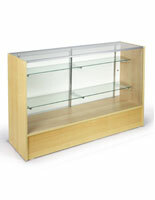 We ship this showcase knocked down to offer our customers a significant discount on a fully assembled showcase. 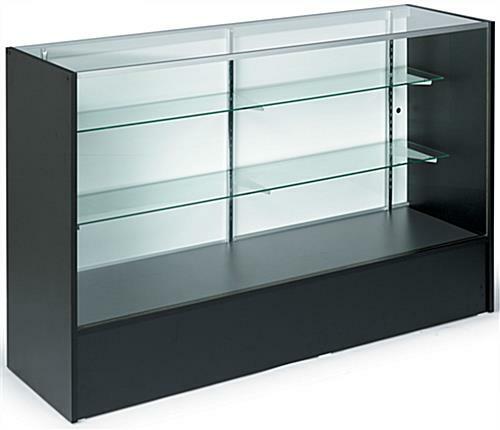 By purchasing a knocked-down showcase, you are saving money on warehouse assembly and the high cost of shipping a fully-assembled glass display showcase. 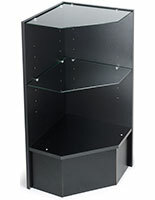 Assembly of this showcase is simple but does require two people. We have filmed a step-by-step video of how to assemble the showcase, for your convenience. 58.0" x 38.0" x 17.5"